They already have a strong attachment to certain dishes, and as they grow up these meals will be remembered and recreated with, I hope, the same comforting happiness I attach to my childhood meals from my mum and grandparents. Most people love their mum’s roast chicken, or their Granny’s apple crumble. Although in my case I’ve developed a love for frozen chocolate gateaux wafted with the aroma of Player’s Navy Cut cigarettes. It’s a funny thing, nostalgia. I don’t think they will talk fondly of Daddy’s lark’s wing soufflé with basil foam, compressed finger lime and watermelon (Nb.) but will probably look fondly on the roasts, bolognese, crumbles, ‘taco day’, korma with fluffy rice and soothing dhal and the simple home cooking we all crave as adults. The classics are classic for a reason. And generally survive because of their simplicity. That doesn’t necessarily mean they’re all completely easy to make. A beurre blanc or Hollandaise can easily split, a risotto can become as thick and stodgy as Donald Trump and a salmon steak can be as tough as a shoe if you don’t pay attention. But the pleasure these simple dishes give is as joyful as a walk on a misty autumn morning or reading a book by the fire on a cold night. 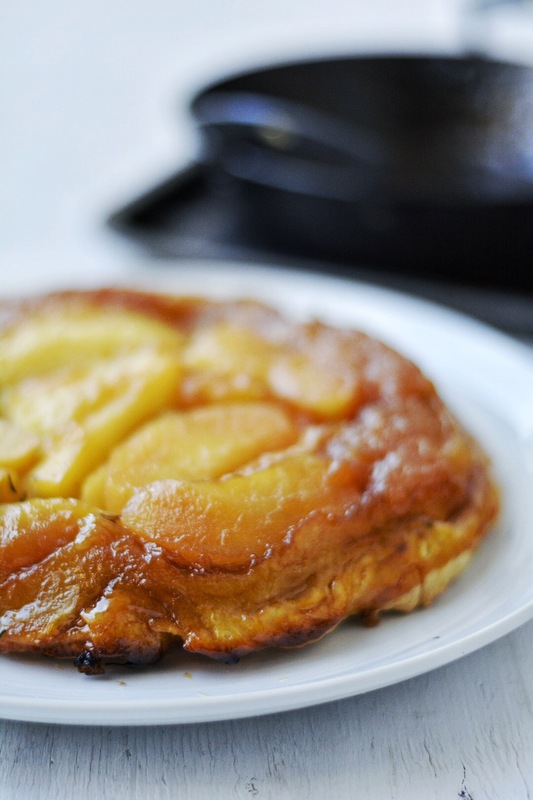 And so to the tarte Tatin. Or, if you prefer, the tarte Solognote. Traditionally made with apples it’s the French comfort food par excellence. I also love making it with pears, but may cast my net as wide as mirabelle plums, apricots and even banana for a laugh. It also works brilliantly with shallots for a savoury version. Make sure you use a good pan that is suitable for the hob and oven. I use the incomparable prospector pan from Netherton Foundry, a thing of great beauty. This time, I made my own puff pastry from scratch. It’s a wonderful thing to do and the difference is sublime. It’s very easy, really, it just takes a little time so do it on a weekend, make plenty and freeze it. I’m not going to give a recipe here for it, but be prepared to use a whole block of butter. You’ll also need a dedicated spot in the kitchen, it needs rolling, folding and chilling about seven times. Failing that, buy some all butter ready-made puff pastry. You can’t be as smug, but it will still give a very good result. I used a mix of Bramley and Braeburn apples this time, but fully Braeburned is usually how I roll. I also sprinkled a little thyme into the mix but that’s up to you. Whatever you choose to do, this is a dish of most excellent comfort. Get the oven nice and hot. About gas mark 8 or 220c. Heat the sugar in the pan until it melts and starts to turn to a soft caramel. Add the butter and neatly layer in the apples. Cook for a minute or two then add the thyme if using and layer the pastry over the top, tucking it in around the apples edges. Transfer to the oven and cook for about twenty minutes, until the pastry is risen and golden. Remove from the oven and carefully turn upside down onto a plate. Leave for a minute before removing the pan and serve hot or warm. Or eat it cold from the fridge just before bed when no-one’s looking. *Not true. They normally ask for a yoghurt or banana or the occasional biscuit. We haven’t raised Veruca Salt and her brother here.